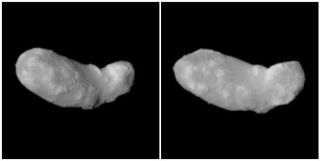 Hayabusa's view of asteroid Itokawa. The Japanese space probe has closed in on the object. Future objective of the spacecraft is to sample the asteroid and then return those specimens back to Earth.